I’ve been playing around with an SDG805 arbitrary waveform generator. I’ve previously used the SDG1025 which I found to be a pretty reasonable bit of bit for the price. 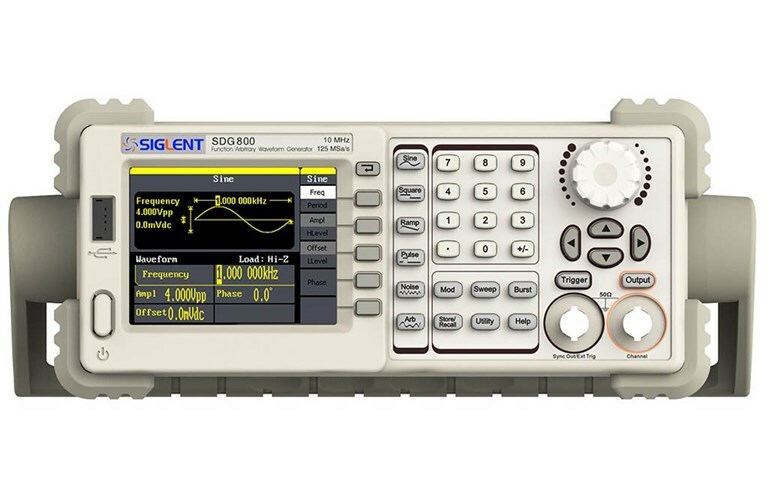 The SDG805 is a 5MHz generator and costs about 200USD. It has a 125MSPs DAC and is available in version upto 20MHz. In fact the 805 can also generate waveforms far faster than the stated 5MHz by loading a repetitive waveform into the arb memory. It seems likely that there are only software differences between the various version of the SDG800. It also seems likely that the SDG800 series runs linux. Particular given recent statements by the Siglent CEO that all future Siglent products will be based around Linux. And if I have something that runs Linux… well I’m going to want a console on it. 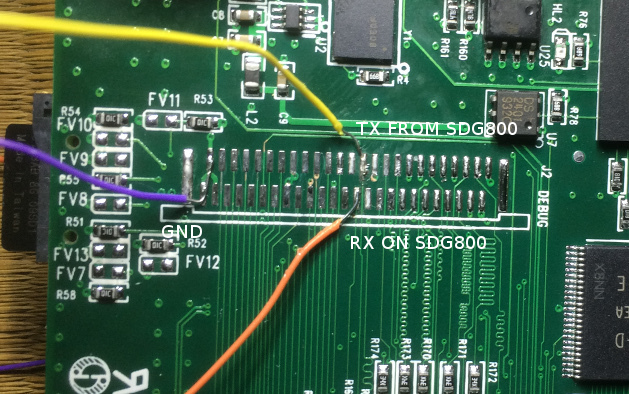 You’ll need to read out the nand flash in chucks and then stitch them back together but it should be possible to read out the complete rootfs this way. A word or warning, don’t run the “boot” command with a SD card in the slot. It will erase the flash (including uboot) and try and write a new flash image from data on the SD card (which it wont find unless you’ve put it there). After the system boots, you’ll get a login prompt. However I don’t know what the password is. With access to uboot however it’s most likely reasonable straight forward to craft a new FS and gain access to the system. [ 0.191902] RPC: Registered named UNIX socket transport module. [ 0.191916] RPC: Registered udp transport module. [ 0.191925] RPC: Registered tcp transport module. [ 0.191935] RPC: Registered tcp NFSv4.1 backchannel transport module. [ 1.175362] 0x000000000000-0x000000020000 : "SPL"
[ 1.181698] 0x000000020000-0x000000040000 : "SPL.backup1"
[ 1.188655] 0x000000040000-0x000000060000 : "SPL.backup2"
[ 1.195607] 0x000000060000-0x000000080000 : "SPL.backup3"
[ 1.202544] 0x000000080000-0x000000260000 : "U-Boot"
[ 1.209658] 0x000000260000-0x000000280000 : "U-Boot Env"
[ 1.216454] 0x000000280000-0x000000580000 : "Manufacturedata"
[ 1.224900] 0x000000580000-0x000003080000 : "rootfs"
[ 1.249114] 0x000003080000-0x000003680000 : "kerneldata"
[ 1.258378] 0x000003680000-0x000006880000 : "firmdata0"
[ 1.285815] 0x000006880000-0x000009a80000 : "firmdata1"
[ 1.313255] 0x000009a80000-0x000010000000 : "datafs"
[ 1.836874] UBI: MTD device name: "rootfs"
[ 2.015769] Logo image from nandflash, color_addr=[0xc88cb034], color_len=[0x4b000]! [ 2.167385] USB Mass Storage support registered. [ 2.238336] oprofile: using timer interrupt. [ 2.297684] ThumbEE CPU extension supported. [ 2.495320] UBIFS: mounted UBI device 0, volume 0, name "rootfs"
[ 2.540872] VFS: Mounted root (ubifs filesystem) readonly on device 0:13. [ 4.894387] UBI: MTD device name: "datafs"
[ 5.268653] UBIFS: mounted UBI device 1, volume 0, name "rootfs"
[info]can't find the file /usr/bin/sdg800/usr/usr/upgrade/upgrade_info. No need to upgrade! [ 5.937248] UBI: MTD device name: "firmdata0"
(none) login: [ 6.201253] UBIFS: mounted UBI device 2, volume 0, name "firmdata0"
[INFO]: The file exists,you need not to do anything OK! (none) login: [ 6.463863] UBIFS: mounted UBI device 2, volume 0, name "firmdata0"
(none) login: [ 6.726747] UBIFS: mounted UBI device 2, volume 0, name "firmdata0"
[ 6.979949] UBIFS: mounted UBI device 2, volume 0, name "firmdata0"
[ 7.239014] UBIFS: mounted UBI device 2, volume 0, name "firmdata0"
[recover_datafs_old_fileprocess '-/bin/login' (pid 631) exited. Scheduling for restart. (none) login: [INFO]:cali_new_load_sys_file_data():line=1445:sysInformation.DdsVersionNum = "SDG805"
[INFO]:cali_new_save_sys_info():line=1552:Save default sys_info file p_path = "./firmdata0/cali" OK! process '-/bin/login' (pid 727) exited. Scheduling for restart.